US print house Paper Monster have just dropped 5 new prints from the New York based artist Momo. Momo was in London recently and if you've been looking up around the streets of East London you might have spotted some of these colourful prints. Momo has experiment with this series with since January creating something like 400 different prints. He has chosen his favorite 5 to create the "Best Of" series and made a screenprint edition of 5 each. 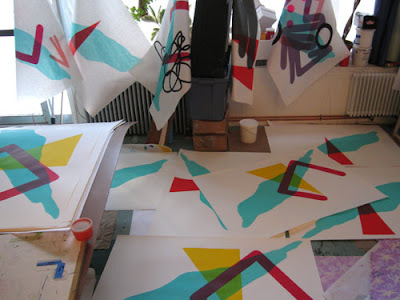 These prints are HUGE measuring 38 by 50 inches on some heavy art paper, Signed, Embossed, and Numbered by MOMO. Available now on Paper Monster here. Check out some of Momo's other projects over on his website/ blog Momoshowpalace.